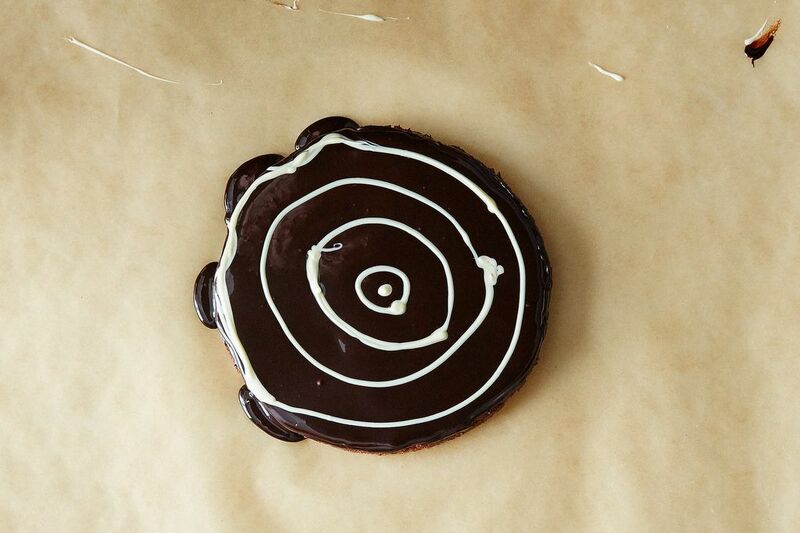 Today: An easy, artistic way to make your glazed desserts instantly more impressive. 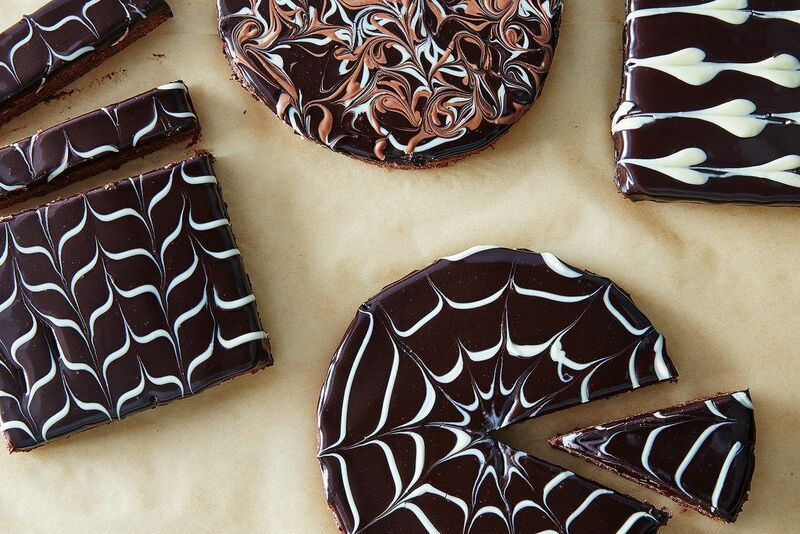 Everyone loves the classic marbled spider web pattern on cakes, or the neat chevron design on Napoleon pastries, or that sweet little string of tiny hearts that some chefs make. These classic patterns—plus gorgeous free-form designs—are enormously impressive, yet so easy to master! 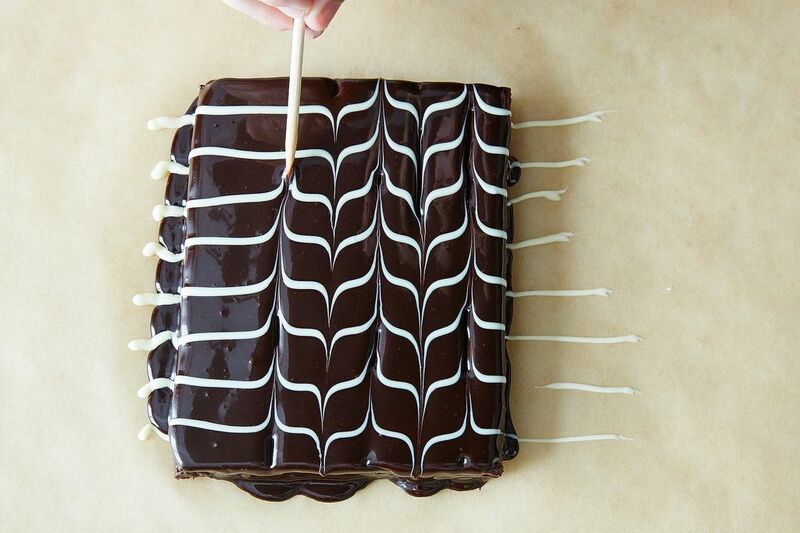 The idea is to start with a cake or torte freshly coated in chocolate glaze, then immediately apply melted white or, if the glaze is dark chocolate, milk chocolate, and drag a fine artist's brush or bamboo skewer through the glaze to make a beautiful marbled pattern before the glaze begins to set. 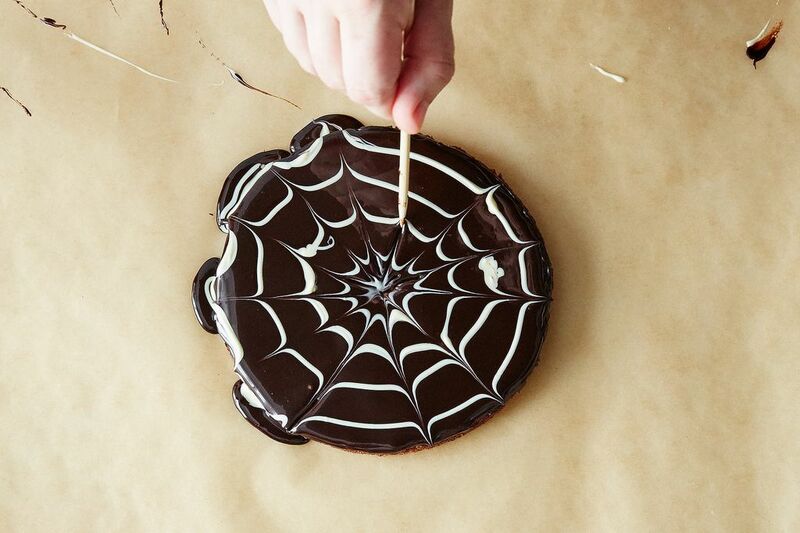 A cake decorating turntable or Lazy Susan is great (you can rotate the cake while piping or dripping the chocolate and again while marbling), but not necessary. The best tool for marbling glaze is a fine artist's brush or bamboo skewer (or even a toothpick); any of these will make a prettier effect than the classic knife blade. Handmade paper cornets are needed for piping chocolate in even, precise stripes, spirals, or curlicues, but fabulous results can also be had by dripping or drizzling chocolate imprecisely from a spoon or spatula! The glaze on the cake must still be fluid (not yet hard or even beginning to set up) when you marble it, so it’s best if a cake is at room temperature rather than cold. For both the base layer and the design on top, a fluid, pourable glaze works better than a thick frosting. 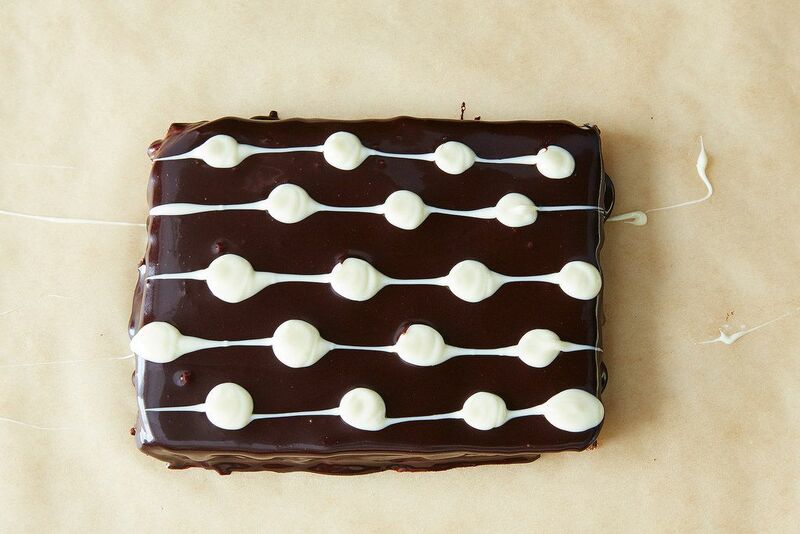 To make the glazes, melt chocolate from a bar or use professional wafer or discs; don’t use chocolate chips because they are too thick (not fluid enough) when melted, which means they do not pipe or drizzle well. 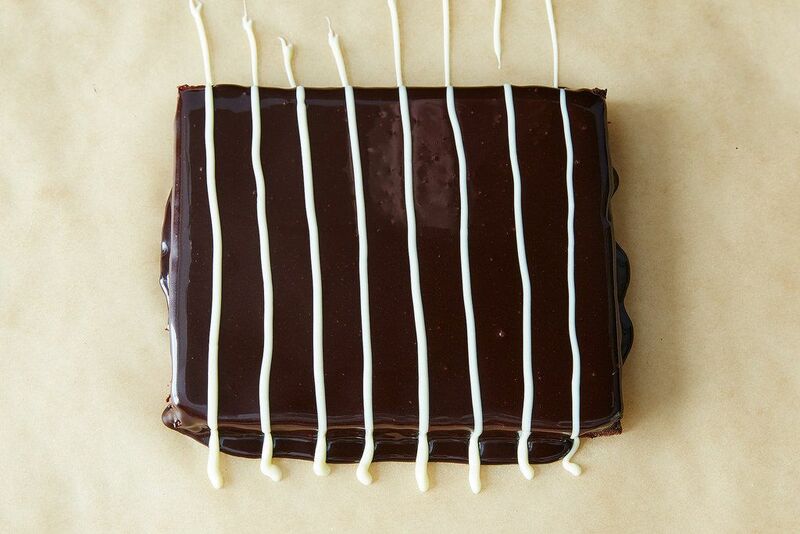 If the chocolate glaze is dark, marble it with white chocolate and or milk chocolate for color contrast. Using both is extra special. 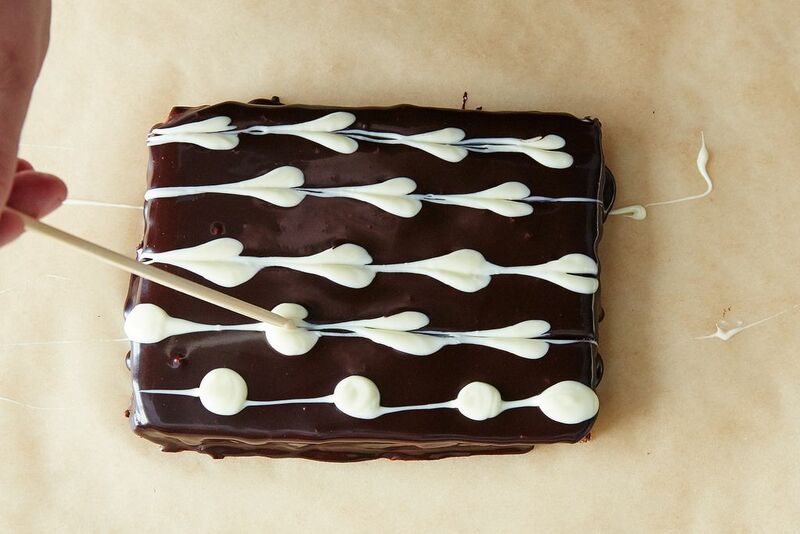 Have tools and melted chocolate for marbling ready and standing by before you glaze the cake; otherwise, the chocolate might start to set too soon. If you are going to pipe (rather than drizzle) the chocolate, fill the cornet and snip the tip just before you start to decorate. 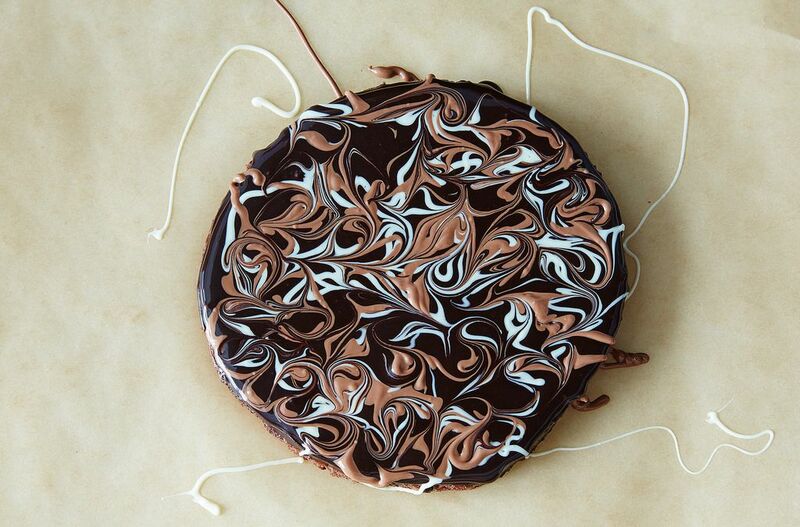 Once the cake is glazed with the base coat, immediately apply the chocolate for marbling: Neat spirals or stripes, random scribbles, uneven drips, blobs or dots, or any kind of marks make for beautiful marble designs. 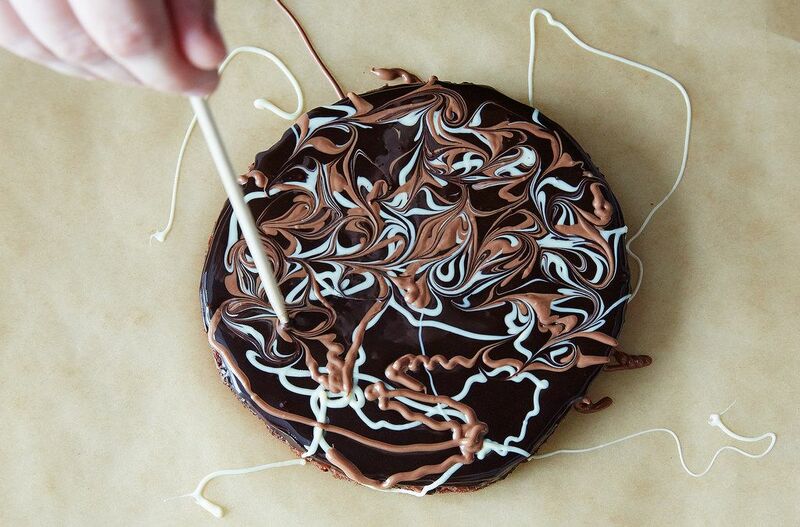 As soon as you’ve applied all of the chocolate decoration, immediately begin making the strokes for marbling. Draw the brush or skewer through the glaze, using any kind of stroke you like. Take care that the brush or skewer remains on the surface of the glaze: A deep stroke is not as pretty and may stir up crumbs from the cake beneath the glaze. Be sure to use a light touch. 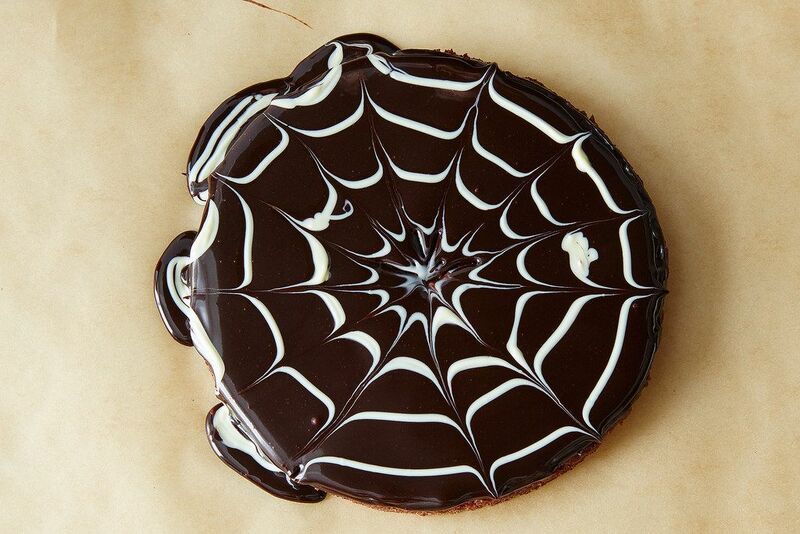 Spider web: Pipe chocolate in concentric circles or a tight spiral from the center of the cake to the edges. Drag the brush or skewer from the center to the edge of the cake, going all around. To make it more interesting, add a second set of strokes between the first, this time dragging the brush from the edge of the cake to the center. 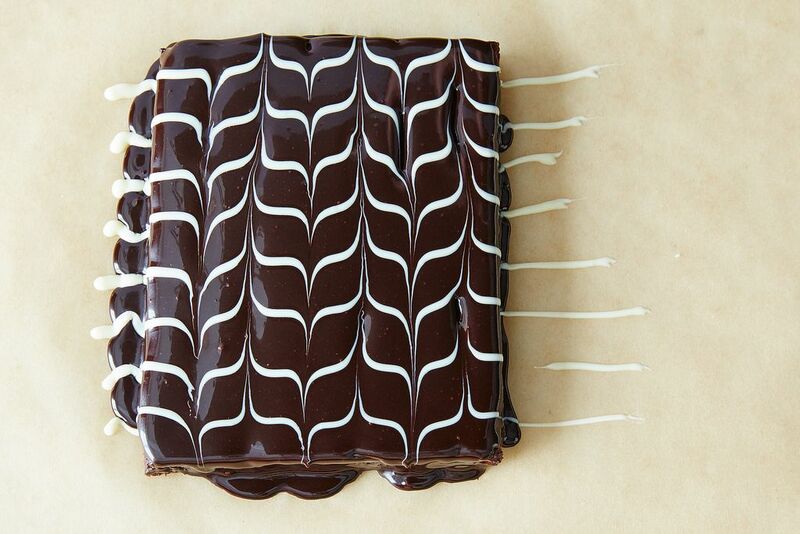 Napoleon/Chevron: Pipe parallel lines across the cake or pastry. 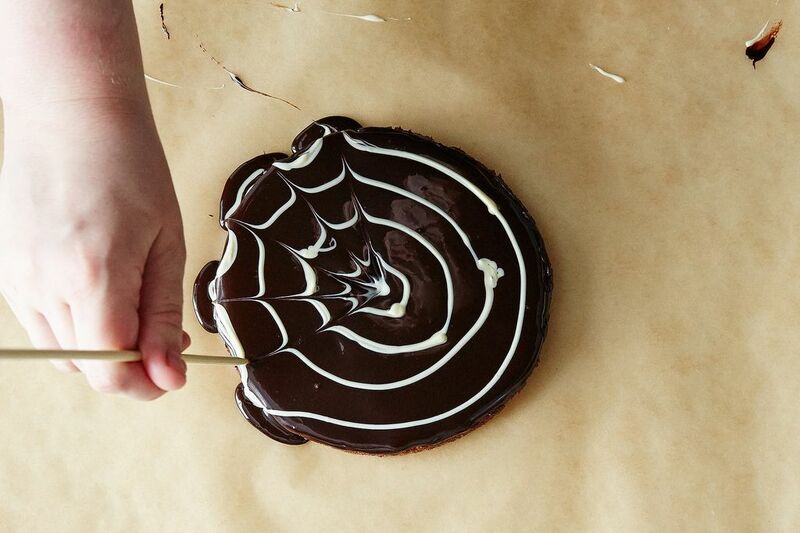 Rotate the cake a quarter turn and drag the brush or skewer back and forth across the lines. String of hearts: Pipe dots of any size anywhere on the cake, or in circles or a continuous spiral from the center of the cake going outwards. Drag the brush or skewer through each dot, transforming the dots into hearts. 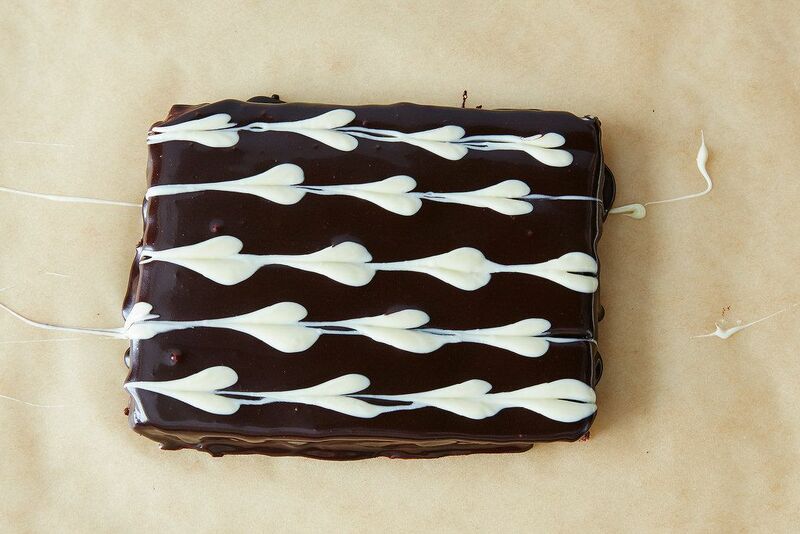 Alice’s choice (with or without the paper cornet): You can either pipe the chocolate from a paper cornet or let it drip it from the end of a spatula in random scribbles all over the cake (don't worrying about precise patterns or neatness—even little blobs are fine!). 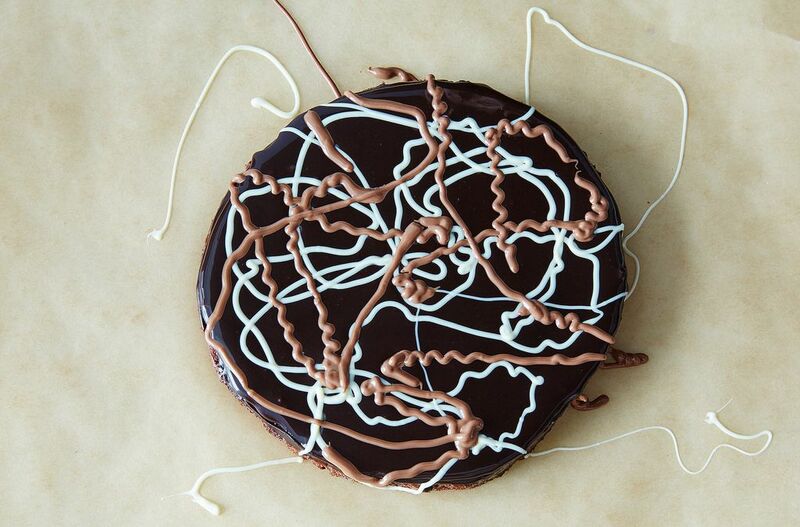 Drag the brush or skewer in looping curlicues, crossing over the scribbles and through the blobs of chocolate until it looks fabulous.